Best Options: Book an organized hiking tour to Jiuyanlou. In this way you will not have to worry about how to get there, where to sleep and how to get fed along the way. Private excursions to Jiuyanlou are disadvized. One slip, one broken ankle and the trouble will not have been worth it. Jiuyanlou Wall sections are unrestored, steep and often dangerous. Smart hikers go in pairs or a small group so one can help the other along, which is especially helpful when access stairs have collapsed or other steep gaps must be bridged. If you insist, you can arrange for your own exploration of this wall section after 1 or maybe several organized tours. Jiuyanlou Great Wall of China location coordinates; 40° 28' 51.18" North, 116° 30' 8.39" East. Location: -- Township, Huairou District, in the 4 Rural Districts of Beijing City Province, China (P.R.C.). Jiuyanlou (九眼楼), the Nine Eyed Tower is found in Huairou District, and more or less forms the northwestern termination point of the remains of the Jiankou Great Wall section. The Jiuyan Lou, itself, is an unusually large and elaborate watchtower found perched high atop a steep mountain ridge along the line of the Great Wall. During the time of the Ming Dynasty (1368 AD - 1644 AD) this tower was in use as an important regional command post and was the station of the regional commander of this section of the Great Wall (Jiankou and Jiuyanlou). The tower has three layers, and there are nine holes which look like nine eyes on each side. Apart from the Nine Eyed Tower, there is no continues line of the wall and but sparse remains and a few broken bases of what were once watchtowers can be found. Although a few trails can be seen on the Satellite Image Map. As there is however no continuous map there is no clearly hiking trail following the path of the Great Wall at Jiuyanlou. Most hikers refer themselves to the neighboring Jiankou Great Wall sections to the East and South, which with its 8 kilometers in length is recognized as one of the most scenic semi-wild walks along the Great Wall in Beijing. In order to visit the Nine Eyed Tower and explore some of the ruins in its vicinity, study the available Google Map of Tianjin-Beijing and Hebei Great Wall of China (Follow link or see below and at bottom of page) and trravel directions. Make your own arrangements for hiking and transport. A Full Google Earth Supported Map of Jiuyanlou Great Wall by AsiaReport.com. Adjacent Map gives direct access to Jiuyanlou Wall Map by Google. Jiuyanlou, Nine-Eye Tower is a unique structure as it is the largest-scale watchtower of Great Wall of China found in the Beijing regions. The tower, adjacent fortress and wall were built in the year 1543 AD, during the Jiajing (嘉靖) Reign of the ShiZong (世宗) Emperor, during Ming Dynasty Era (1368 AD - 1644 AD). The spot of the tower was especially well chosen as it looks out on various nearby Great Wall section, such as Moshikou, the so called "Beijing Knot", Jiankou and even beyond to Zhengbei Lou at the very south eastern border of Jiankou and Mutianyu Great Walls. In its original form the tower measures 7.8 meters in height and 13 meters wide. Unusually, it consist of not two but three layers, and originally there were three windows to each layer on each side of the tower, creating a total of nine holes on each flank. Peering darkly from the somewhat mystical ruins of this massive tower the windows appear like nine dark eyes looking out on each side allowing for the Nickname “nine eyes tower”. Also at nine, the Liuyan Tower contains the greatest number of crenels of any tower along the entire Great Wall. Besides the tower, the crumpled walls of a small fortress found due west of the tower on somewhat lower ground can be explored. This fortress was the station of the Garrison added for security of the regional commander and shows the importance of this specific site. In the immediate area are more sites of interest such as the "Beijing Knot" of the Great Wall, the Jiankou Great Wall and a place known as Nangou crossing of the Great Wall, not to be mistaken with the more famous Nankou Pass of the inner layer of the Great Wall of China further to the west in Yanqing County near Juyongguan Fortress. The Nine Eyed Tower of the Great Wall is one of the hardest to reach sections of the Great Wall of China in Beijing City Province. Both driving routes from the center of Beijing require hours of driving, of which many along single lane mountainous routes. The best advice is to travel to a village nearby the wall (most choose Xizhazi for some reason) and make your hike the next day after staying overnight at a hostel run by local farmers. Today, of the original Jiuyanlou only two sides remain and only 7 of the arched windows still stand. A steep section of stairs lead up to the tower. Around the tower one can find old stele rocks carved with Chinese characters. Although half of the tower has fallen some of the top platform is still intact. The Jiuyan Lou and a difficult to trace line of the Great Wall of China are situated in what is known as the Jiuyanlou Scenic Area which includes the Heitou Shan (Black Heap Mountain) and lies immediatly due north of the somewhat larger Huairou Xiangshuihu Natural Scenic Area a popular refuge for those looking to escape the humm and buzz of the city for a few days, especially in the usually simmering hot summer months. The point if the Jiuyanlou Tower lies roughly on the border between Huairou District and adjacent Yanqing County. That said, the best general information one can provide is that the ruins of Jiuyanlou stand at the north-western termination point of what is known as Jiankou Great Wall of China. The Jiankou Great Wall is a curvy section which runs roughly from south to north through the mentioned Huairou Xiangshuihu Natural Scenic Area. In its last few throws at the northern end, it disappears for a brief stretch after which it continues from the village of Xiaoweichang northward into Jiuyanlou Scenic Area. west until even the ruins disappear and no sign of the wall can be found for several miles onwards. Altogether, the Jiuyanlou does not rank high on the standard list of Great Wall sections to explore. Due to its lack of towers and continuous wall, as well as awkward and difficult to reach location It is not a destination for organized tours. However, for those who insist on steady hiking, it can be reached following the full length of the Jiankou Great Wall adjacent. Count on a rough exploration. Although a path has been defined at most points, several visitors report hours of struggling up hillsides against the abundant green brush. The Jiuyanlou is not an especially interesting section of the Great Wall except for its wildness and significant and unique Jiuyan Lou, the Nine Eyed Tower once in use as the regional command center. 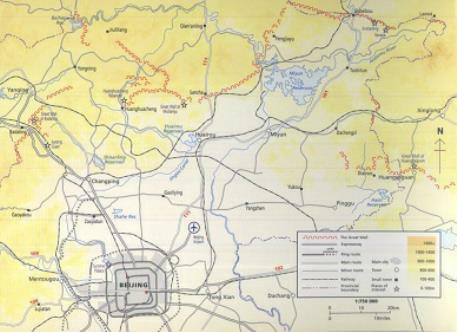 An old Hiking Map of the Mutianyu-Jiankou-Moshikou and Jiuyanlou Strecth of the Great Wall in Huairou District of Beijing. it is an often steep and dangerous climb not to be attempted by the unpracticed. extend north-westward from this village giving the shorest acces route to the Jiuyanlou and ruins. The Great Wall runs along the top of the ridge around the valley and the Jiyanlou section lies at the very western end of the valley atop the ridge. Getting to Xizhazi Village however is not easy. There are no large highways cutting through this mountainous section of Huairou District and only one road leads to Xizhazi from the East. That is, the route leads via the Qidao River Valley westward to a small place known as Nangou, which in turn connects to Xizhazi. Beyond is only a valley that terminates at the foot of the Great Wall. In all directions the village is surrounded by mountains and various designated natural scenic area's. The Zhao Farm Family Hostel is noted among Great Wall hiking enthousiasts for welcoming hiker visitors to both Jiankou, the "Beijing Knot" and Jiuyanlou Great Wall sections. 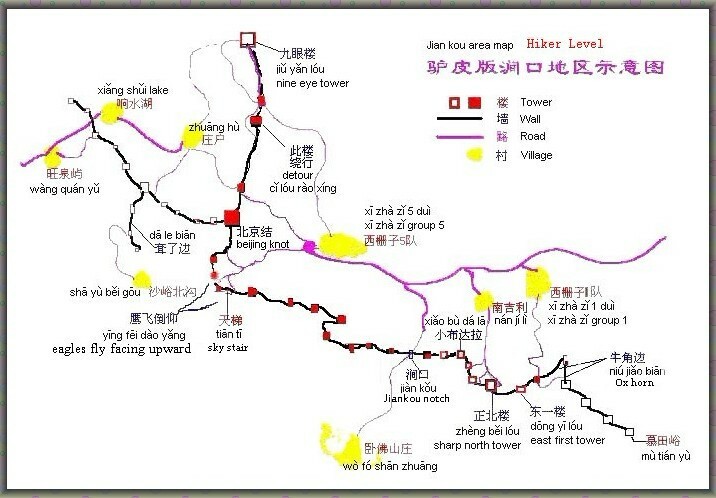 The shortest hiking route to Jiyanlou is not found on the side of Xizhazi Village in the south-east, but can be accessed from Shiyaocun Village in the northwest. This however requires an entirely different route, driving around from west to east. This route can be picked up via S213 Provincial Road which leads through the Huaijiu River valley northward to Haizikou Village and Great Wall and then beyond to the larger and more important Sihai Zhen. At Sihaizhen the route finally turns eastward. From Sihai Zhen follow along S323 Provincial Road and then continue on the one-laned Guoshi Road to Shiyao (cun) village. Once having arrived at the village of Shiyaocun the path is easy to find as it continues from the western end of the village and is the only road. From a parking lot and the ticket office of Jiuyanlou Scenic Area it leads from the north southward up to the crest where the Jiuyanlou stands. This path is around 2.5 kilometers (1.6 mile) in length and a well paved pathway. 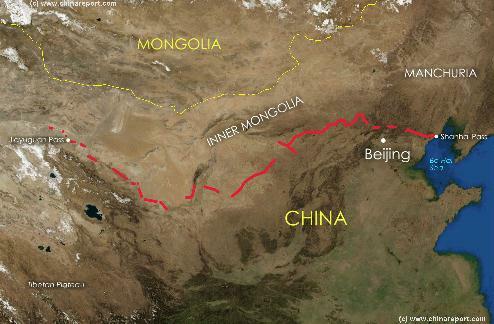 Check the available Google Satellite Image Map of Tianjin-Beijing and Hebei Great Wall of China for perspective.